This DeWalt 20V MAX Lithium-Ion Right Angle Drill includes a new deep hex chuck, which allows you to recess the bit further back into the head of the tool, shortening the overall front to back length of the drill with a bit inserted. Dual speed ranges (0-650/0-2000 RPM) for increased user flexibility and the multi-grip trigger provides comfort and convenience, allowing you to get into tighter spaces while still having access to the trigger. The DeWalt XRP 18V Cordless Hammer Drill/Driver is built around a robust high-efficiency motor that delivers up to 2,000 RPM and 34,000 BPM to easily power through a range of tough materials in a variety of tasks. Great for masonry work, this versatile tool features a three-speed, all-metal transmission that matches the tool to the task for fast application speeds and improved runtime. Want better visibility while you work? The LED light brightens up even the darkest of spaces so your eyes are always able to see what they're doing. The DEWALT DCD778L1 20V MAX XR Lithium Ion Brushless Compact Hammerdrill Kit is lightweight and compact for working in tight spaces for long periods of time. A high-speed transmission delivers 2 speed variations allowing users to choose the level of performance needed for various applications. Comfort grip adds balance and control for precision. The DCD791D2 20V MAX XR Lithium-Ion Brushless Compact Drill / Driver Kit is lightweight and compact for working in tight spaces for long periods of time. High-speed transmission delivers 2 speed variations allowing users to choose the level of performance needed for various applications. Comfort grip adds balance and control. The DCD792 Cordless Compact Drill/Driver with Tool Connect is based on the latest DEWALT XR Brushless Drill (DCD791) with additional integrated Bluetooth&reg; technology. Connect to the Tool Connect free mobile app and Inventory Manager web portal to track, manage and customize the tool. With Bluetooth integrated within the tool, you do not need a Tool Connect battery to utilize tracking functionality. The Tool Connect 3-part inventory management solution includes the app and Inventory Manager web portal that work together to help you better communicate updates from the field to the office. You will get updates regarding the whereabouts of tools, materials and equipment, meaning your assets are tracked during the day and accountability is placed on appropriate crew members. Use Tool Connect tools along with Tool Connect batteries, the Connector and the Tag for a complete inventory management solution. 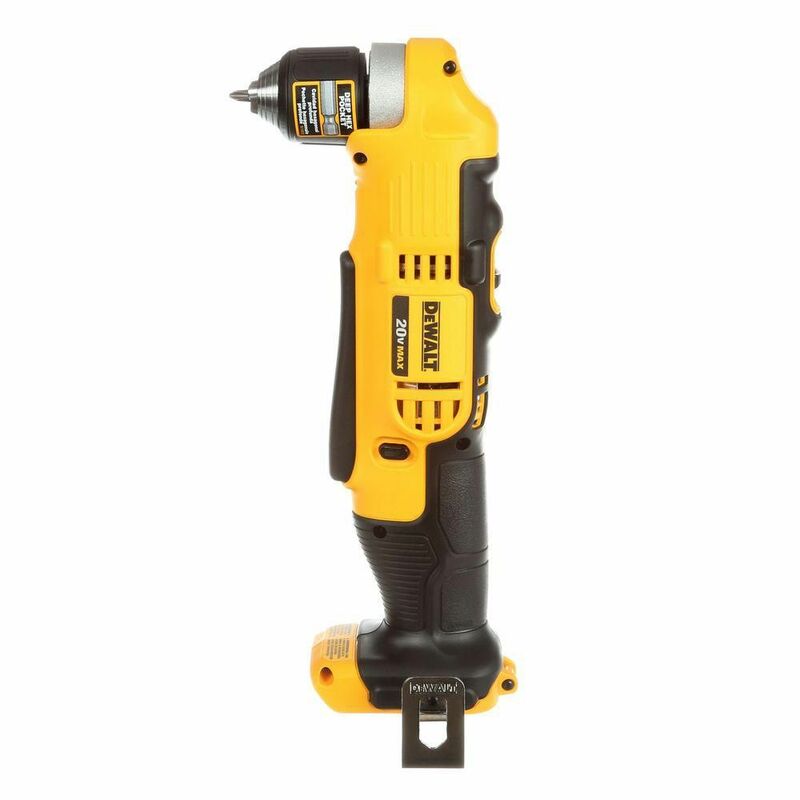 20V MAX 3/8-inch Right Angle Drill/Driver (Tool Only) This DeWalt 20V MAX Lithium-Ion Right Angle Drill includes a new deep hex chuck, which allows you to recess the bit further back into the head of the tool, shortening the overall front to back length of the drill with a bit inserted. Dual speed ranges (0-650/0-2000 RPM) for increased user flexibility and the multi-grip trigger provides comfort and convenience, allowing you to get into tighter spaces while still having access to the trigger. 20V MAX 3/8-inch Right Angle Drill/Driver (Tool Only) is rated 4.3 out of 5 by 75. Rated 5 out of 5 by nascarfan43 from Works well in tight places. Keyless chuck. Could be a... Works well in tight places. Keyless chuck. Could be a little shorter but it will get the job done. Rated 5 out of 5 by Barb from Very nice my son loves it!... Very nice my son loves it! Rated 4 out of 5 by alexhb from If you need it, you need it, this fits into... If you need it, you need it, this fits into tight spaces that other drills won't. The build quality of this drill is on par with Dewalt's budget 20V cordless stuff, but the chuck's grip range is too small to use with many auger-style drill bits and the chuck feels a little cheap.